This year started pretty much the same as each year had before it. The National Pie Championship was in Celebration, Florida, registration due one month before the actual competition, I starting practice baking around Christmas, rented the same house for one week, and was meticulous about every detail…almost to distraction. 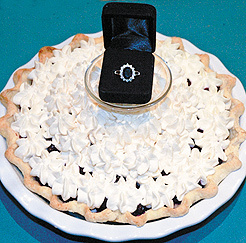 Then an email arrived from Linda Hoskins, president of the American Pie Council, telling the membership that this year the APC was adding a special category for Wedding Pie—A pie inspired by the upcoming royal wedding. That evening, I researched “wedding pie” on the Internet. The majority of on-line entries were regarding English wedding pies filled with savory ingredients. None were dessert pies. The one criterion to enter a pie in the Nationals is that is must be a dessert pie. What to do? What to do? I took a break, poured myself Coke Cola, and watched “My Name Is Earl”. During a commercial break, one advertisement offered a replica of Princess Diana’s engagement ring—the large sapphire Charles her given her. The voice-over cautioned that “only one per household” could be ordered for the simple price of $19.95 plus shipping and handling. After locating my credit card, my Royal Wedding Pie inspiration was on its way. Before my replica arrived, I decided that the pie would be blueberry to represent sapphires and the topping white; symbolic for weddings. I started baking experiments and was satisfied, finally, with a basic pastry shell covered with a layer of wild Maine blueberry preserves, topped with a fluffy layer of softened cream cheese blended with confectioners’ sugar, topped again with a simple wild Maine blueberry pie-type filling. I whipped up my grandmother’s sweetened whipped cream and, using my pastry bag, decorated the top of the pie coming to a peak in the center. For the finishing touches, I permanently attached fine wedding lace around the outside edge of a white Emile Henry ceramic pie dish and placed a glass stand in the center of the pie to hold the open velvet engagement ring box with the replica of Princess Diana’s sapphire engagement ring. I was satisfied…until I found out who one of the judges would be. Chef Darren McGrady, former chef to the Royal Family and private chef to Princess Diana was asked to Florida to judge the Wedding Pie competition. I’ve read his book of recipes and memoir and one of my favorite stories was of an early job Chef McGrady held at Buckingham Palace to prepare the carrots for the Queen’s horses. He would take three carrots, peel, trim and top them off. He would then slice them lengthwise and in half so each carrot was of equal length. The night before we turned our pies in, I lost sleep wondering if I should have placed each blueberry in its place, spatially, before topping with whipped cream. The pies were entered, moved to refrigeration, and eventually judged. I met Chef McGrady later that day and found him to be a fine gentleman and courteous man. He shared many tales with me about cooking for the royals and reminisced fondly about his time with Princess Diana and her two sons. I walked away glad to know this, this chef, and was thrilled knowing he judged one of my creations. So just as with pie, there are so many layers of winning.